The real-PC version of Microsoft’s Surface tablet, the Surface Pro, becomes publicly available this Friday, February 9. So far, I’ve seen stories on the new tablet from Paul Thurrott (SuperSite for Windows), Ed Bott (The Bott Report, ZDNet), David Pogue (NYT), Jon Phillips (PCWorld), and countless others (run this Google News search to see dozens of serious, reputable reviews and commentary, amidst thousands of blogs, opinion pieces, news reports and more). 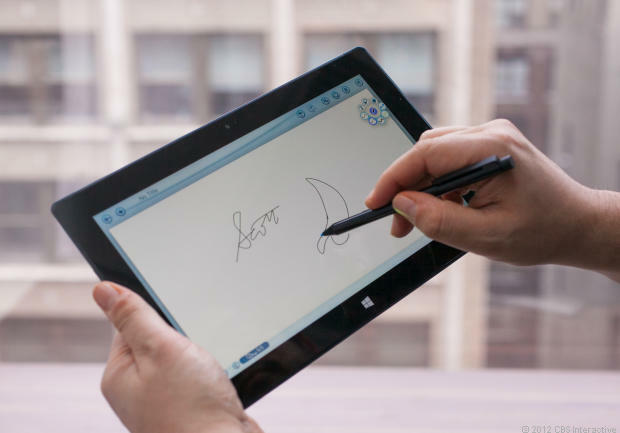 The Surface Pro supports a Wacom digitizer pen, which many reviewers liked (Source: CNET). 1. Battery life is indeed a problem, as it was expected to be, with 4-6 hours of battery life available for varying usage scenarios. 2. Overall functionality and capability (aside from how long the battery holds its juice) are uniformly positive, but that positivity varies from lukewarm to medium, and seldom jumps into rabid enthusiasm. 3. The 1920×1080 true HD display gets uniformly good ratings for sharpness, clarity, and readability, and beats 1366×768 displays hands-down. 3. As a tablet, the Surface Pro gets ho-hum ratings from the experts; as an ultrabook, it does somewhat better, especially with the Type cover. It’s never positioned as a world-beater by anybody, though. 4. These days a 64 GB SDXC memory card — which the Surface Pro will gladly accommodate — costs anywhere from roughly $40 for a slow model, to upwards of $150 for a pretty fast one (over $200 for the fastest models). This provides an easy way to stretch the 89-plus GB of free storage space available on the Surface Pro’s 128 GB SSD. 128 GB SDXC cards should become available later this year, but will also be costly. In general the experts are pretty broadly split on their decisions regarding the Surface Pro, with about half saying “So-so, not the greatest, not my cup of tea,” and the other half opining that for those looking for maximum portability with real Windows PC oomph it’s the best choice among the other offerings of its kind available from Acer, Samsung, Sony, and others. In revisiting about a dozen of those reviews, I note that the reviewer’s final opinion often rests on how strongly wedded they are to Windows computing in general, versus a more catholic or platform-agnostic view of the overall mobile computing space. …this is a great product for anyone who’s already committed to a Microsoft-centric work environment. It isn’t likely to inspire many iPad owners to switch, unless those Apple tablets are in the hands of someone who has been eagerly awaiting an excuse to execute the iTunes ecosystem. I don’t expect Surface Pro to be a breakout hit for Microsoft. Too many people will have good reasons to say no, at least for now. But it does represent a solid, interesting, adventurous alternative for anyone who wants to spend some quality time today exploring Microsoft’s vision of the future. To me, this makes the upcoming super-ultra-low voltage Haswell processors due out from Intel later this year even more interesting — and important for the future survival of the Surface Pro models, and perhaps also for the future of PC and notebook computing as we understand it today. If the new chips mean that Microsoft (and other hardware designers) can trim the extra 0.5″ that currently separates the RT from the Pro model (and others of those ilks) and boost battery life to the 8-10 hour range, by golly, we might just have something. If that doesn’t happen, though, the real question will become: Is there enough there to make buying into this hardware vision worth doing for business and more serious personal users. Methinks not. Methinks further that the emergence of the Chromebook phenomenon is likely to play hob with this entire set of market dynamics. Do you think the Surface Pro is a 'make-or-break' product for Microsoft?